Scrolled wrought-iron fireplace screen with copper overtones. Acanthus leaf accents and three hinged panels. 49"W x 1.5"D x 38"T.
Handcrafted fireplace screen. Brass-plated iron; mesh backing. 40"W x 7"D x 31"T. Design mimics the graphic lines of a Mondrian design. Antiqued-brass finish. For use with wood or gas logs. Imported. Boxed weight, approximately 40 lbs. Handcrafted of iron. Hand-painted silver-leaf finish. Open geometric frame; no mesh backing. For use with gas or wood logs. 40"W x 8"D x 31"T. Imported. Boxed weight, approximately 17 lbs. 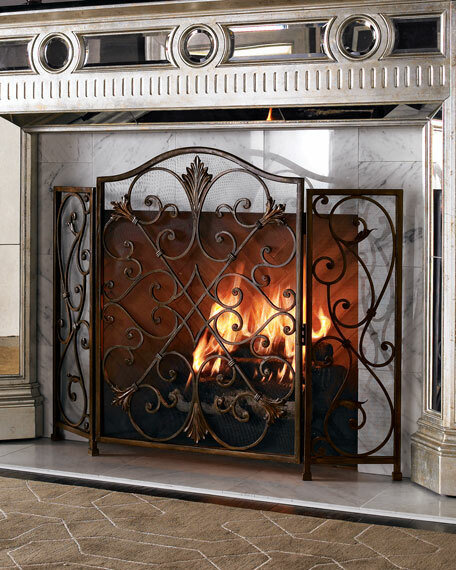 EXCLUSIVELY AT NEIMAN MARCUS Handcrafted fireplace screen. Iron frame with assorted florals in hand-painted taupe colors for each flower. Iron tole. Outdoor safe. 38.5"W x 8.5"D x 30.8"T. Imported. Boxed weight, approximately 15 lbs.